guests Wes Jackson, Bill Vitek, Aubrey Streit Krug. The Loch in the Ravine, North Woods, three days before the Sound and Sight Walk. 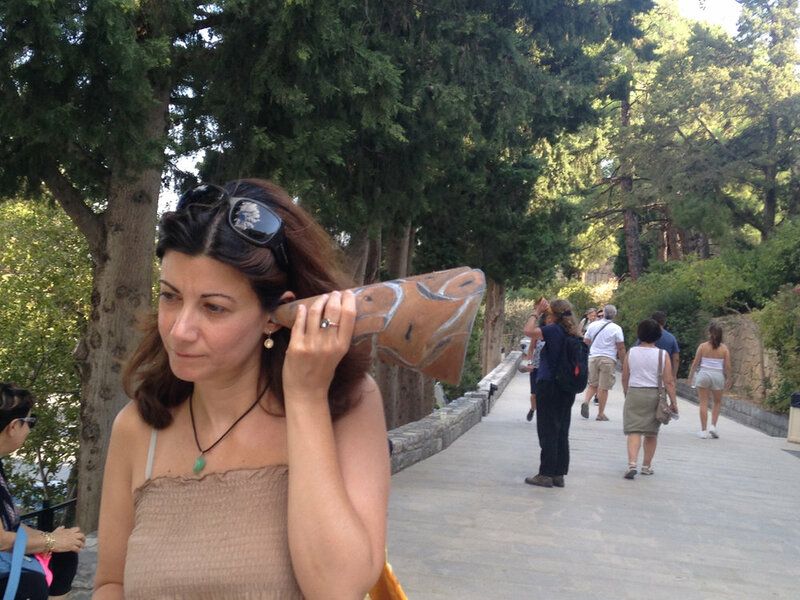 Listening to a waterfall on the Loch, Ten hand carved wooden burl trumpets used by participants, walk planned and led by Karen McCoy by invitation of the Walk Exchange, NY. Listening to wind in the dry oak leaves at the Blockhouse, Ten hand carved wooden burl trumpets used by participants, walk planned and led by Karen McCoy by invitation of the Walk Exchange, NY. 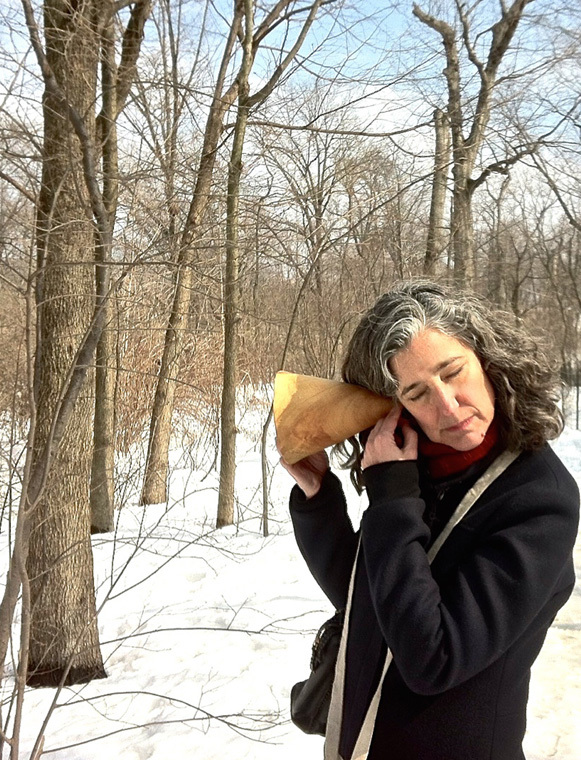 Listening to water trickling under ice on the Loch, Ten hand carved wooden burl trumpets used by participants, walk planned and led by Karen McCoy by invitation of the Walk Exchange, NY. 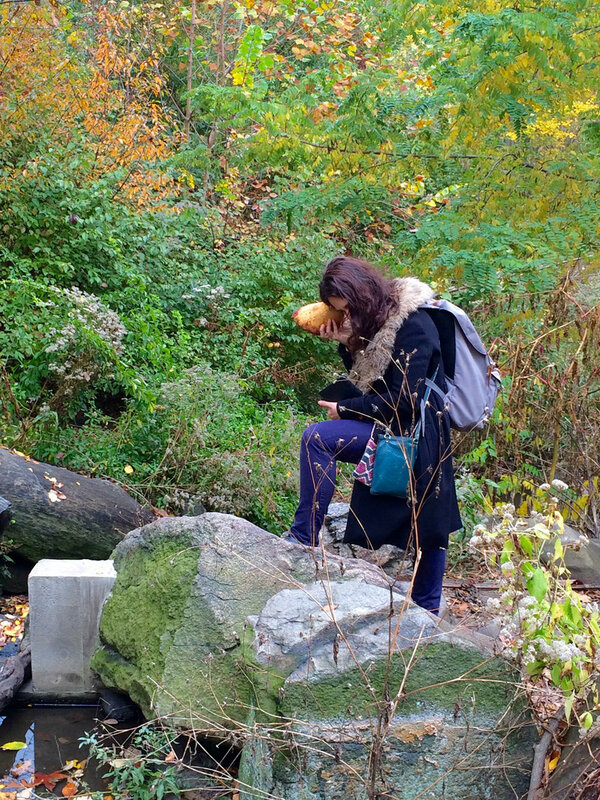 Lydia listening intently to the Loch, hand carved wooden burl trumpet in use, walk planned and led by Karen McCoy by invitation of the Walk Exchange, NY. 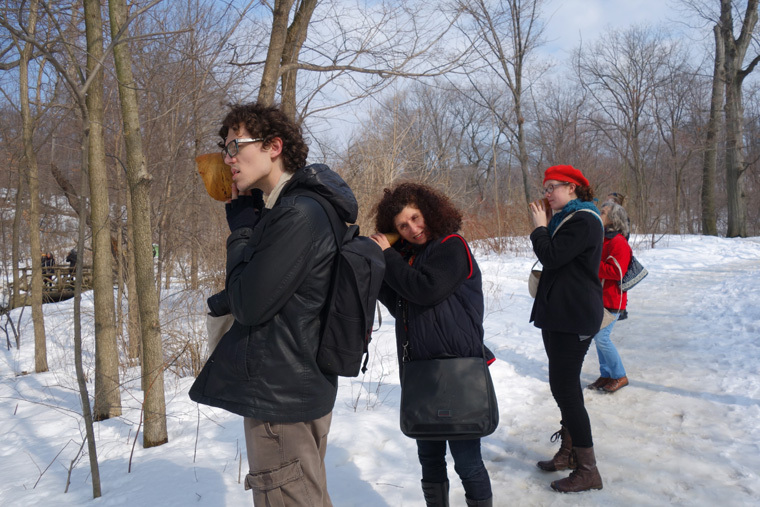 Michele, Raleigh, Maureen and Doug listening at the Loch, Sound and Sight Walk in the North Woods of Central Park, New York City, March 8, 2015. Ten handcarved wooden burl ear trumpets used by participants. 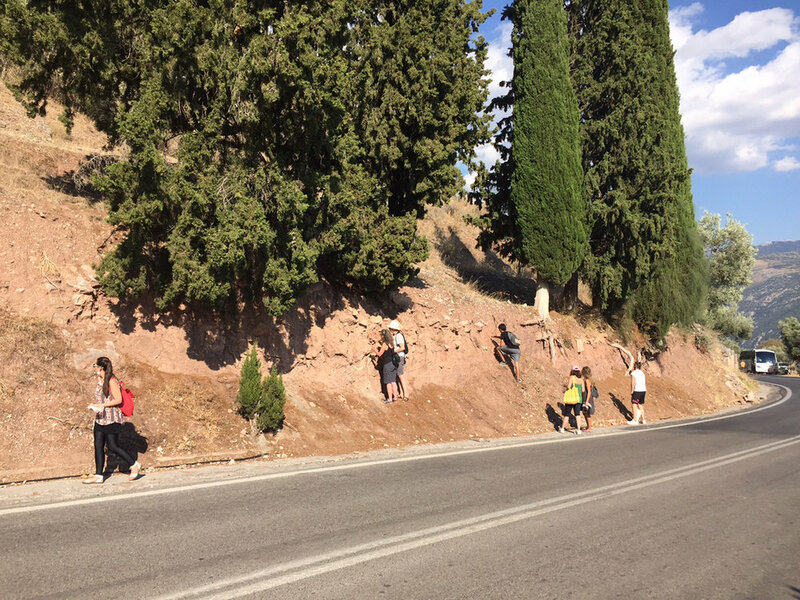 Walk planned and led by Karen McCoy by invitation of the Walk Exchange, NY. Fifth Avenue at 110th Street. Pattern for Print, Cut and Fold open source paper listening trumpet, 2014, original drawing with pigments found in Wales on black Stonehenge paper, 9x 12”. Print, Cut and Fold open source paper listening trumpet, 2014, original drawing with pigments found in Wales on black Stonehenge paper, shown rolled with tabs partially inserted in slots. Print, Cut and Fold open source paper listening trumpet, 2014, original drawing with pigments found in Wales on black Stonehenge paper, shown rolled with tabs inserted in slots and ready for listening. Print, Cut and Fold open source paper listening trumpet, 2014, original drawing with pigments found in Wales on black Stonehenge paper, shown in listening position. The trumpet must be carefully aimed at sound source to function at maximum potential. Footwork group leaving CAT to walk with Jess Owens to the wind turbine array in the Welsh countryside that was the subject of her film. 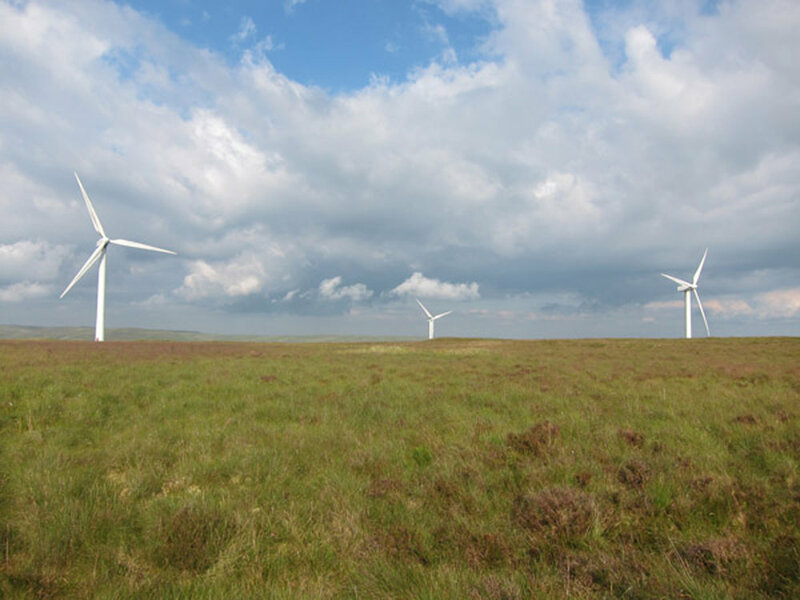 Footwork members walking with Jess Owens to the wind turbine array in the Welsh countryside that was the subject of her film. The goal of the 20 mile hike, the wind turbine that was the subject of Jess Owens’ film. Series of 10 listening trumpets. L-R Bebo, Elmo, Cono, Wild One, Belder, Oak, DarkFront, The Beak, Malm, Medge, wood, beeswax, linseed oil and/or shellac (Garnet Lac). 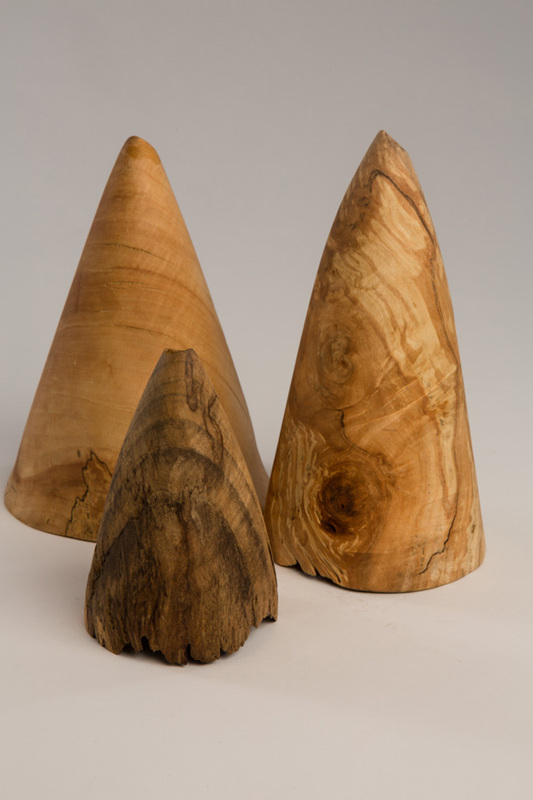 With special thanks to the “Lathe Guru” in Central Shop at the Kansas City Art Institute, Jon Reginald Wilson.